Adam McLean in action in the Supertwin class at the Ulster Grand Prix in 2017. Up and coming road racing prospect Adam McLean has set his sights on ruffling the feathers of the established big guns this year at the international meetings. 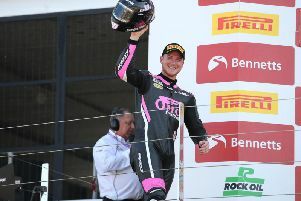 The 22-year-old from Tobermore has already claimed a rostrum at the Ulster Grand Prix in the Supertwin class after an excellent ride to third place at Dundrod last summer. However, after adding the latest Z650 Kawasaki to his stable of machinery for 2018, McLean hopes he will have the firepower needed to run at the front at the North West 200 and Dundrod. He finished sixth in the opening Supertwin race at the North West last year and impressed again with an eye-catching ride to fourth in the second Supersport race. At the Isle of Man TT, McLean was seventh fastest in practice for the Lightweight race as a newcomer and was running in ninth place when he was forced out on lap three with machine trouble. He has signed for the Isle of Man-based IMR team to race a 600cc Yamaha and 1000cc BMW with backing from Quinnstheprinters.com this season, but McLean will continue to ride for Roy Hanna in the Supertwin class as the pair embark on their seventh season together. “We have a 2017 Z650 Kawasaki for this year and it’s almost ready. We’ve been working flat-out with it over the winter and it’ll be nice to have something as competitive as anything else out there, espeBIcially for the internationals,” McLean said. “The bike I had last year was lacking a little bit of speed but this should put me on a level playing field with the frontrunners. “We’ll do the best we can and with a competitive machine, hopefully we can be right at the very front. Reflecting on his misfortune at the TT, McLean said that although he was bitterly disappointed to be forced out on the penultimate lap, he took away plenty of positives from his performance. “I was lying in ninth position in the Lightweight race when we had a problem with the bike,” he said. “It was disappointing to break down on the third lap, but at the same time it was nice to show that we were able to run in the top ten as a newcomer. The unassuming Ulsterman was keen to pay tribute to loyal backer Roy Hanna, who has been involved with his career from the beginning. “It’s nice to be heading into my seventh straight season together with Roy and he has been a brilliant mentor to me over the years. “Roy has had a significant impact on my career so far, so I want to say a massive thank you to him for staying on board again. Adam can be contacted via email at amr27@hotmail.co.uk or on his Facebook page Adam McLean Racing 56.